SAP HANA database developers can list table columns names and column properties for a specific table using SQL via system views like SYS.TABLE_COLUMNS In this SQLScript tutorial, I want to show how programmers can list database table columns and build the list of table columns as a concatenated SQL string variable. Following SAP HANA database SQL codes will help developers to get the table structure for various tasks during database SQLScript developments. 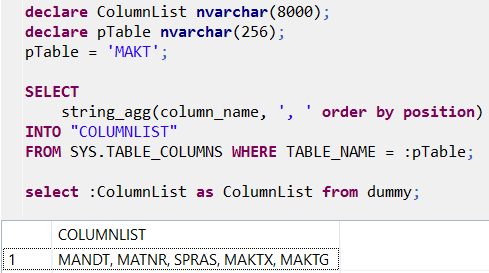 For example, to list all column names of SAP MAKT table where the MARA material description translations are stored, following SQL Select statement can be executed. You see, I query system view sys.table_columns which provides information about all table columns by filtering table_name field with the target table name. As seen in following screenshot, displayed columns are the most important and frequently refereneced fields of a HANA database table. Another SQLScript code example that I want to share in this tutorial with database developers is concatenating all column names of a HANA table using STRING_AGG() function to form a single string variable.